But they will have to beat a number of local racers all eager to shine in front of their home crowd – among them 18-year-old James Buckton from Harrogate in his historic Elden Formula Ford, York’s Robert Rook and Selby’s Jim Clark in their Ford Lotus Cortinas, fellow saloon car racer Andy Yool from Barrow-in-Furness in his Ford Anglia, Workington’s Robert Gates in his evocative E-type Jaguar and Whitley Bay’s Richard Evans in his sensational March Formula 2 car. 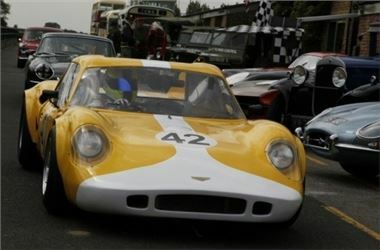 There's also 'adopted local' Nick Fleming from Upper Largo, Fife in his stunning Chevron B8 sportscar (pictured above). Photo above gives a taster of some of the 800 or so machines that will either be in race action or on display during the Croft Circuit's Nostalgia event this coming weekend, 6-7 August. Click here for a copyright free hi res version.